1-1 split yesterday for our leans, which were both first period moneylines. The Sharks’ first period dominance at home continued as they carried a 2-0 lead over Montreal into the first intermission. The Canadiens still have scored only one goal in the first period on the road this year, and that’s a trend we’ll look to continue exploiting until it changes. Our first period loss was on the Wild to win the first period in Calgary. Things were looking good when Minnesota got on the scoreboard before the 4-minute mark, but the Flames answered with 2 goals – just the 4th and 5th goals the Wild has allowed in 13 first periods on the road – to win the period 2-1. 12 games today in the NHL. Just an FYI that we’ve put up this daily post earlier than usual because of the several afternoon games on the schedule, so the goaltending info might not be as reliable as usual. Good luck tonight! It might be risky to back one of the two struggling teams in this matchup, but we think the situation favours the host Avalanche much more than the visiting Stars. Colorado’s playing the final game of a 5-game homestand in which it is winless. After this game, they visit the red-hot Predators, followed by stops in Boston and Montreal. Basically, this looks like their best chance at a win over the next week or so, and a game the Avs simply must have. Although Colorado is 0-4 in its last 4 games, they have put up a fight in the last two against very tough opponents – losing 5-3 to Nashville and 3-2 to Columbus. Now they get to host a Dallas team that is beyond frustrated right now. The Stars are making the final stop on a 4-game road trip that has not produced a victory yet, and they have to be looking forward to getting back home. Dallas was routed 6-2 in Pittsburgh Thursday night (to be fair, it was a 3-2 game til midway through the third period) and the Stars have scored just 18 goals in regulation time over the past 9 games. They’ve also been shredded for 19 goals in their last 5 games and 35 in their last 10, which bodes well for a Colorado squad that has scored 3+ in 4 of its last 6 outings. Reasons to bet Boston: The Bruins are 2-0-1 in their last 3 games, allowing just 4 regulation time goals in that span. Buffalo has lost its last 4 home games to Boston. Reasons to bet Buffalo: Sabres offence looks completely different with Jack Eichel, scoring 9 goals in last 2 games after scoring 12 regulation time goals in previous 8 games. Boston’s scored just 19 regulation time goals in its last 10 games. Reasons to bet Carolina: The Hurricanes haven’t lost by more than 1 goal since Nov. 10, going 6-3-1 in that span. New York has allowed 2+ goals in 8 straight games. Reasons to bet New York: The Rangers beat Carolina 3-2 at home on Tuesday, coming back from an early 2-0 deficit. New York has won 22 of its last 27 home games versus Carolina. Reasons to bet Chicago: The Blackhawks are 3-0-1 in their last 4 games without Jonathan Toews and are expected to have their captain back today. Philadelphia has allowed 2 goals or more in all but 1 of its games this season. Reasons to bet Philadelphia: The Flyers have won 12 of their last 13 home games against the Blackhawks. Chicago has scored just 9 regulation time goals in its last 6 games. Reasons to bet New Jersey: The Devils have scored 17 goals in their last 5 games. New Jersey has collected at least one point in 4 of its last 5 visits to Nashville. Reasons to bet Nashville: The Predators are 8-1-1 at home while the Devils have 3 wins in 14 road games (3-7-4). New Jersey has lost 4 straight and 7 of 8. 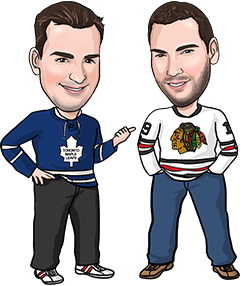 Reasons to bet Toronto: The Leafs have scored 4 goals or more in 6 of their last 10 games. Toronto has won 5 of its last 6 meetings with Vancouver. Reasons to bet Vancouver: The Canucks are seeking revenge for a 6-3 loss in Toronto Nov. 5 when several fights broke out in the third period. Toronto is just 2-6-4 on the road. Reasons to bet Winnipeg: The Jets have scored 3 goals in 3 straight games, after managing just 6 goals in their previous 5. St. Louis has allowed 14 goals in its last 4 games. Reasons to bet St. Louis: The Blues are 11-1-2 at home, while the Jets are 3-8-2 on the road. Winnipeg has lost 10 of the last 13 meetings. Reasons to bet Florida: The Panthers have earned at least one point in 7 of their last 10 games (6-3-1). Florida outshot the Senators 40-23 in a 4-1 win Nov. 19 in Ottawa. Reasons to bet Ottawa: The Senators are 4-1-1 in their last 6 games, scoring 17 goals in that span. Florida has managed just 6 regulation time goals in its last 5 outings. Reasons to bet Washington: Capitals should be motivated to rebound from 3-0 loss to Islanders Thursday at home. Tampa has lost 4 in a row, getting outscored 19-9 in those games. Reasons to bet Tampa: Lightning should also be focused to snap out of 4-game losing streak. Capitals have scored 2 goals or less in regulation time 7 times in their last 10 games. Reasons to bet Detroit: Red Wings are unbeaten in regulation time in 5 straight games, going 3-0-2. Pittsburgh hasn’t won 2 straight games since Nov. 5-8. Reasons to bet Pittsburgh: The Penguins are 9-2-1 at home and have scored 21 goals in their last 5 games overall. Detroit’s lost 8 of its last 10 trips to Pittsburgh. Reasons to bet Columbus: The Blue Jackets are 13-3-1 in their last 20 games and have outshot their last 6 opponents by a combined total of 226-145. Arizona has 17 regulation time goals in its last 10 games. Reasons to bet Arizona: The Coyotes have earned points in 6 of their last 8 games (3-2-3) and allowed just 20 regulation time goals in their last 9 games. Possible letdown spot for the Blue Jackets. Reasons to bet Anaheim: The Ducks have won 3 straight games, allowing 4 goals in that span. Anaheim has beat Edmonton in 26 of the last 31 meetings, and 18 of 22 in Edmonton. Reasons to bet Edmonton: The Oilers have scored 5+ goals in 4 of their last 7 games and are coming off a 6-3 win over the Jets Thursday in Winnipeg.